There is more than one artist with this name: 1) Annie Clark (born 28 September, 1982) is an American multi-instrumentalist singer-songwriter who performs under the moniker St. Vincent. She was a member of The Polyphonic Spree and Sufjan Stevens' touring band. Born in Tulsa, Oklahoma, she began playing the guitar at the age of 12 and as a teenager worked as the tour manager for her uncle's band Tuck & Patti. She grew up in Dallas and attended Lake Highlands High School, graduating in 2001. Following this, she went on to attend Berklee College of Music, dropping out 3 years later. 1) Annie Clark (born 28 September, 1982) is an American multi-instrumentalist singer-songwriter who performs under the moniker St. Vincent. She was a member of The Polyphonic Spree and Sufjan Stevens' touring band. Born in Tulsa, Oklahoma, she began playing the guitar at the age of 12 and as a teenager worked as the tour manager for her uncle's band Tuck & Patti. She grew up in Dallas and attended Lake Highlands High School, graduating in 2001. Following this, she went on to attend Berklee College of Music, dropping out 3 years later. Soon after this, she joined The Polyphonic Spree. In 2003, during her time at Berklee, she released an EP with fellow students, entitled RatsLiveOnNoEvilStar. Clark released her debut album, Marry Me, 10 July, 2007 on Beggars Banquet Records. Named after a line from the cult-hit television show Arrested Development, the LP features appearances from drummer Brian Teasley (Man or Astro-Man?, The Polyphonic Spree), Mike Garson (David Bowie's longtime pianist), and horn player Louis Schwadron (The Polyphonic Spree). 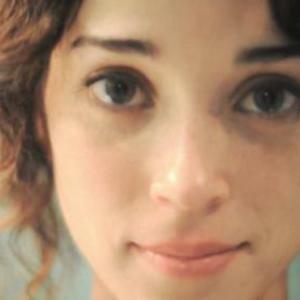 Her second album for 4AD, entitled Actor, was released on 5 May, 2009. It was written entirely by Clark and produced by Clark and John Congleton of The pAper chAse. 2) St. Vincent is the name of singer-songwriter Vincent Bernardy, who has written and recorded music since 1980. 3) St. Vincent is also the name of a singer/songwriter from Victoria, Australia.